This section contains WAFO algorithms for empirical analysis of wave data and for computation of exact wave characteristic distributions from wave models. One of the main objects of the WAFO toolbox is computation of wave characteristic distributions from different wave models. To help with the evaluation of the accuracy of the theoretical results WAFO also contains tools for empirical analysis of observed wave records - one-dimensional analysis of time and space distributions, as well as two-dimensional analysis of joint distributions of, for example, wave period and wave amplitude, are possible. The figure shows the observed distribution of crest period in a wave data set. 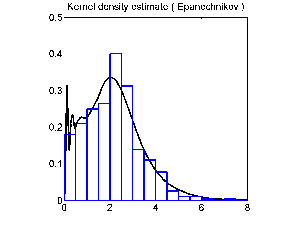 The solid curve shows a kernel estimate of the probability density function. The smoothness of estimate can be regulated - in this example there is very little smoothing for short waves. 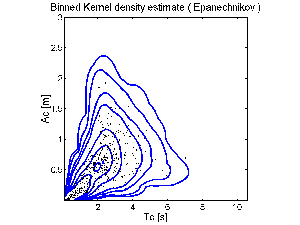 Joint wave period and wave height distributions are found and smootheed by kernel density estimation. By WAFO one calculate theoretical wave characteristic distributions in two ways. Simplest is to use any of the standard approximations suggested by Longuet-Higgins (1975, 1983) or by CavaniÃ© et al. (1976), or the common Rayleigh approximation based on the narrow band approximation. More exact (and just as simple by WAFO) is to calculate the exact distribution based on the full wave energy spectrum (or the equivalent correlation function). The only assumption needed is that the wave process is Gaussian, or that it can be transformedto a Gaussian wave by a memoryless transformation. Both time domain and space domain variables can be calculated. We give an example with a two-peaked spectrum and compare the distribution of crest period and crest length. 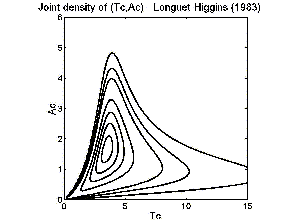 The Longuet-Higgins approximation for joint crest period (Tc) and height (Ac) distribution is based on the joint distribution of the envelope amplitude and the time derivative of the envelope phase. 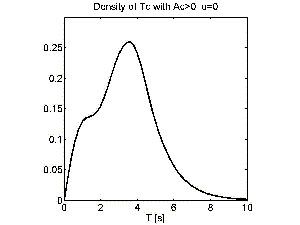 The figure shows the result for a Gaussian sea with JONSWAP spectrum with peak period 10 s and significant wave height 5 m.
In the CavaniÃ© approximation of the joint crest period (Tc) and height (Ac) distribution every local maximum above the mean level is considered as a crest of a wave; the wave is then approximated by a sine wave with the same curvature and height as the maximum. 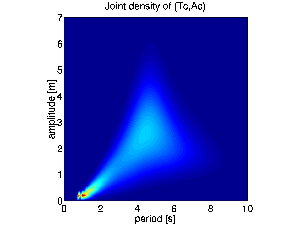 The figure shows the result for a Gaussian sea with JONSWAP spectrum with peak period 10 s and significant wave height 5 m.
Some of the most useful routines in WAFO calculate the exact joint distribution of wave period/length quantities and the corresponding amplitude or height variables in a Gaussian sea. It can also calculate the joint distribution for the height of successive local maximum and minimum values for use in fatigue analysis. Exact distribution of crest period (Tc) and height (Ac) for a Gaussian sea with JONSWAP spectrum with peak period 10 s and significant wave height 5 m.
A Torsethaugen spectrum with significant wave height 6 m and primary peak period 8 sec with two peaks, corresponding to wind driven waves and swell. 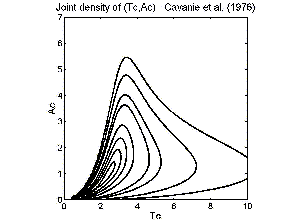 The density of crest period for the Torsethaugen spectrum computed by WAFO. 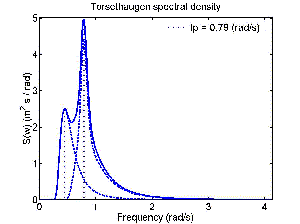 Note the tendency to a mixed distribution, corresponding to the two spectral peaks. WAFO contains an option to swithch between time and space variables. 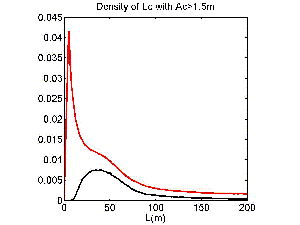 Here is the density (red curve) of crest length Lc in meters, i.e. the distance between a mean level upcrossing and the next downcrossing. Note the tendency to many very short waves. The very short waves can be considered as mere noise, and a more interesting quantity is the crest length for those wave which have a crest height exceeding some moderately high level. The black curve shows the calculated distribution of crest length Lc for waves with crest height Ac>1.5 m (=Hs/4).